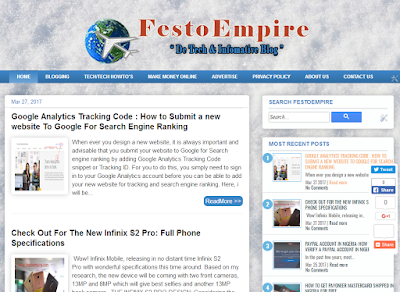 You are their as a blogger, you run any blog on blogger, love the beautiful design template of this Blog (FestoEmpire.com), and you wish to have the same design or would need some adjustments in other to meet your taste without you going through the stress of redesigning the default blogger template, structure and look, then, don't border stressing yourself for i am here to help and get it done for you(Either exact design / Your specification). This Template is designed to work perfectly on every device(PC, Mobile phones,Tablets, Iphones, PDA's etc), It is Optimised for Search engine ranking (SEO), and it Loads Fast. What Can I Do To Setup This Beautiful Blog Design Template In My Blog? The first thing you need in other to get this beautiful template design is an indication of interest. Secondly, you will need to contact me for negotiation on how you can get the template and the process of installation which i am going to guide you through. If you don't want the "Read More" and "thumbnail" i can also remove the code responsible that so that the blog will be displaying posts and full image in a post on the homepage. The Template can also be designed in other colors based on your desire and specification. It will cost you just N10,000 ( $20 ). You can pay for it online, via western union or by direct bank deposit. Once I set it up on your blog, and you notice there are some features on my blog that are not on yours, I will fix that for you for FREE. I will definitely keep record of the email address and blog URL you submit after purchase as they will be required for the FREE edits. All Blogger tweaks and tips on this blog work perfectly with the template. If you've got questions, relay them via comments. You can pay into my bank account at the bank, at ATM or via online transfer. You can also pay online with your card. You can pay into my bank account(s). Kindly contact me to request for my bank account details. If you have questions, feel free to contact me too. 08037343364.